Today I moved my old desktop PC up onto the computer desk (instead of under it), making it fully visible once again. Since it's night time (and I put a bit of work into the side design), I figured I'd snap a couple of pictures and post them. This is the machine that actually ran Aenea for the first 2 1/2 years (all the while being the main computer in my house). It's now about 7 years old and still seeing daily use by myself, my wife, and my boys. It got named "Beast" because it was so much larger than my previous PC, ran a lot faster, and had lots of room for expansion. The front of the machine is lit by two sets of lights. 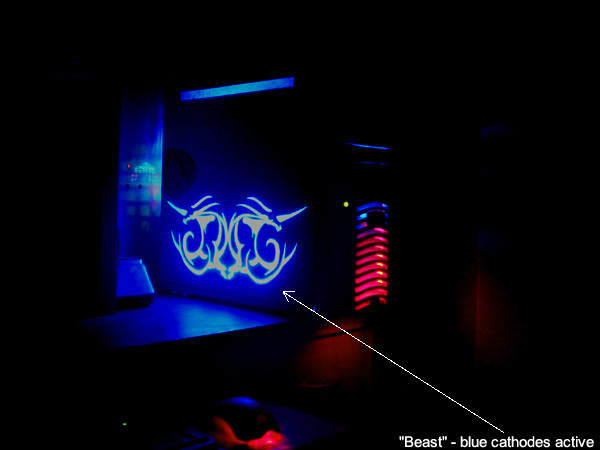 The red is from a trio of bright red LEDs, while the blue is from an LED-lit fan. 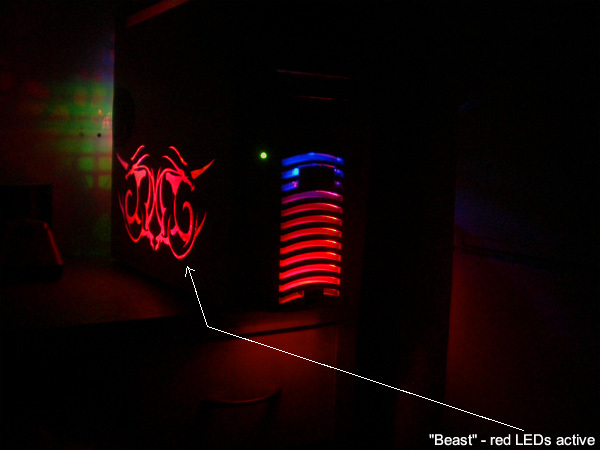 The back is lit from within by and LED-lit fan with green, red, blue, and orange lights. 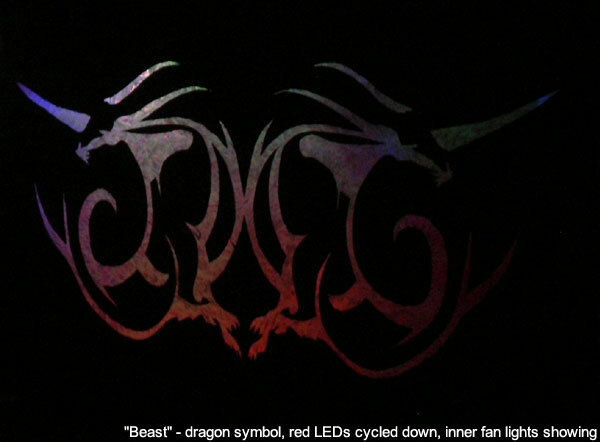 The side design was cut from the steel with my hand-held Dremel and many small cutting discs. Took about two weeks and lots of earplugs, and a crapload of cutting discs, and a sheet of plexiglass I "frosted" with the Dremel. 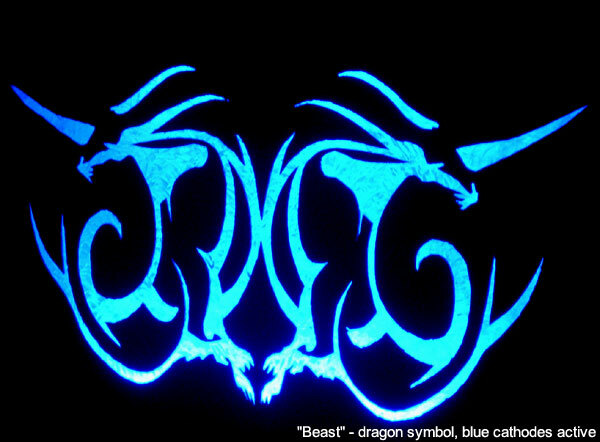 This one is lit by one of two sets of lights A) a pair of bright blue cold cathode tubes or B) a pair of tubes containing moving red LEDs. The pics don't quite do it justice. 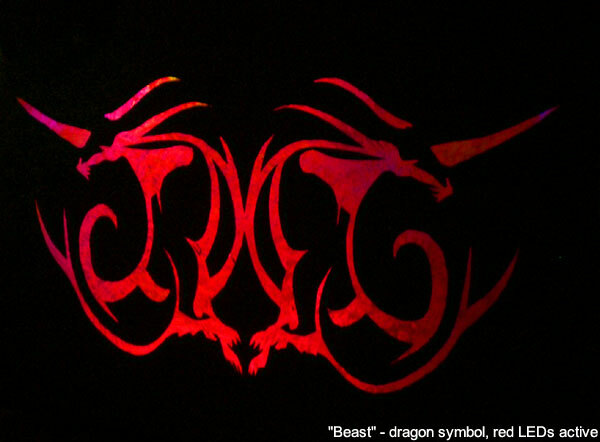 IRL, the colors are much more rich and dark, and the waves or slow pulses of light from the red LEDs behind the symbol are very cool in motion...almost like their's something alive in there. Good work, The Amethyst Dragon, good work! I was gonna post pics of my four-year-old Dell laptop, with the broken LCD display, hooked up all ghetto style to my little flat screen TV. But I didn't want to make you jealous. Amethyst347 wrote: I was gonna post pics of my four-year-old Dell laptop, with the broken LCD display, hooked up all ghetto style to my little flat screen TV. But I didn't want to make you jealous. I dunno about y'all, but I say "Pics or GTFO!" Just kidding about that, Amethyst347, but pics would be cool! Ghetto fabulous!